Paleontologists recently discovered rodent teeth in Peru dating back over 41 million years, making them the oldest evidence of rodents in the Americas. 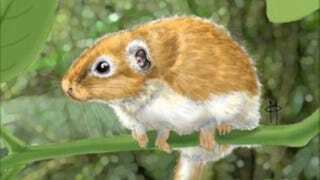 But despite its location, this rodent was far more closely related to today's African, not American, rodents. One of the weirder parts of our evolutionary history is how various animals managed to migrate from one landmass to another. The Americas in particular are home to lots of animals that evolved elsewhere and then somehow managed to make their way across the ocean, with our distant cousins the New World monkeys being perhaps the most dramatic example. Now we can add to that list the rodent you see up top, which has been analyzed by Darin Croft and his fellow researchers at Case Western Reserve University. "As palaeontologists, we're interested in how animals are related to each other, and we do what are called 'phylogenetic analyses.' We did those analyses for our animals and they are very close in the evolutionary tree to African rodents, which suggests that that's where their ancestors came from - from Africa. The teeth are confidently dated using sediment samples to 41 million years old, making them ten million years older than the next oldest example of rodents in the Americas. "They could have got there on some raft of vegetation. That maybe sounds like a fantastic tale, but in fact we do see things like this happening today. You can get big logjams of vegetation that get pushed out of rivers during storms, and often you will see mammals on them. The odds of them making this crossing are obviously very low, but after millions and millions of years the odds of some animals making it go up considerably. And if we go back to the middle of the Eocene when we think rodents might have made this crossing, the two continents of South America and Africa were actually closer together than they are today - about half the distance." Proceedings of the Royal Society B via BBC News. Artist's impression by Maeva Jorliac/UM2.